This is an instruction for C14 and C15 readers that were provided by Yandex.Checkout until June 2018. They allow accepting payments from cards with a magnetic stripe and a chip. Contactless payments (Paypass and others) are not supported. Starting in June 2018, Yandex.Checkout sells new P17 readers that accept payments made with contactless cards (PayPass and others). 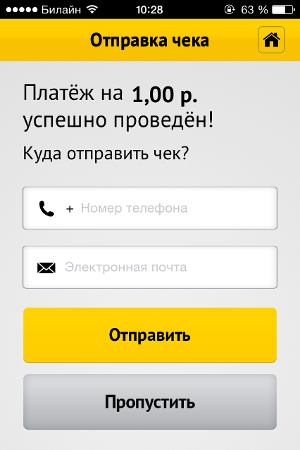 You can order them via your Yandex.Checkout manager. 1. 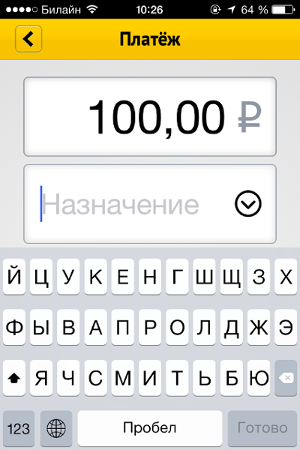 Tap Payment in the app, enter the purpose of payment, such as the name of the product or service. 2. If the card has a chip, insert it into the reader having the chip on the underside. If the card is with a magnetic stripe, slowly and steadily swipe it through the reader. Please note: the reader takes up to five seconds to process the card. 3. Ask your client to sign on the screen. 4. Specify your client's email address or phone number to send the payment receipt. All payments made via our reader are saved to the History section in the app. you allowed the app to use your device's microphone (you can check it in your phone settings). Then try unplugging and plugging the reader again, restarting or reinstalling the app, and rebooting your device. If nothing of these helps, contact the customers support: its phone number is on the sticker on your reader. You will need to name the device's features. View the History section in the app. If the record about the last payment has been successfully saved, view it and ask your client to sign it. You need to complete the process within 5 minutes, otherwise it will be cancelled. If the record is missing from the history, this means the funds were not debited. Start the process over. Try waiting a little: the reader needs up to five seconds to process a card. Make sure the reader is plugged properly, the internet is on, and the device's volume is at maximum. If the card has a magnetic stripe, swipe it again, slowly and steadily. If this is a chip card, withdraw it and insert it again. Reload the app or reboot your device. If it doesn't help, contact the customers support. The phone number is on a sticker on the reader. Problem with the client's card: ask your client to pay using another method. Please note: if you make 15 failed payments within 24 hours, the reader will be blocked until the end of the day. Ask your client to pay using other method. 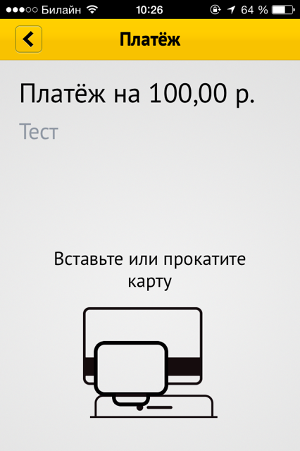 you can accept up to 100,000 rubles a day and 500,000 rubles a month via one reader. Start the payment process again. If the error persists, ask your client to use other payments method and contact our Support Service afterwards: +7 (495) 974-3586 You will need to tell your shopId. Contact our Support Service: +7 (495) 974-3586 You will need to tell your shopId.